Your card looks really lovely, Val. Your popped up butterflies, flowers and leaves look really effective. Love the colours, too. Fabulous card Valerie WOW !!!!!!!!!!!!!!!!!!!! 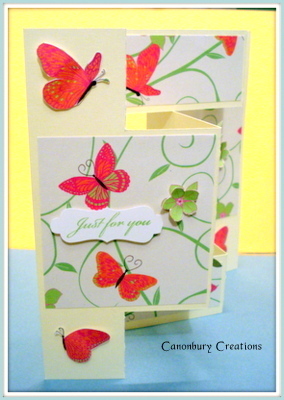 Amazing design gorgeous spring colours and the butterflies and flowers are stunning. 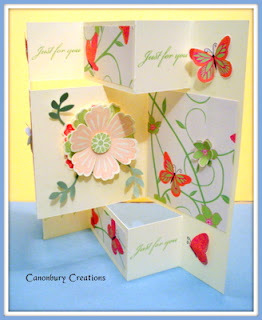 A really pretty spring card Val - really zingy colours. Gosh it must have got really cold in North London.......wet and windy (well perhaps that's just Tony......!) but not that cold yet.......watch this space. Love that fold and the bright and cheerful colors too!